It's hard for clients to understand why photographers charge so much for photos. 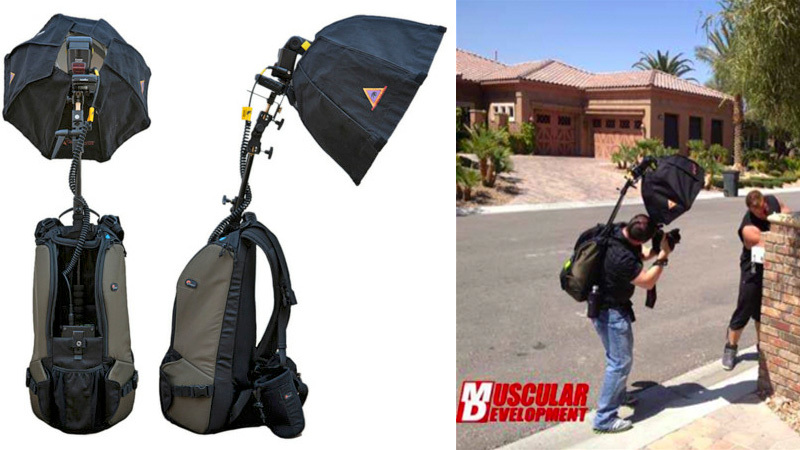 So if you find yourself in the same situation as Ian Spanier — who was hired for a shoot with no money for an assistant — you too can build this impressive-looking backpack studio flash rig. The getup starts with a sturdy LowePro backpack designed for bird watchers carrying a large tripod into the wilderness. But since Ian needed to be able to shoot handheld with lots of freedom of movement, he instead filled the pack with a rechargeable battery powering a Canon flash unit, the necessary framing and mounts to position the diffuser dome about five inches above his head, and wireless receivers so the flash could be triggered without annoying cables tethered to his camera.